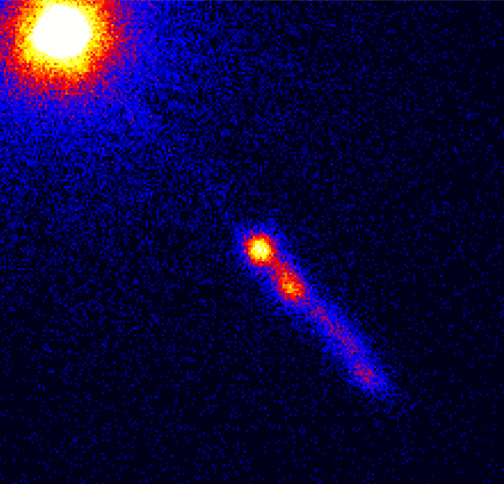 This Chandra image shows important new details in the powerful jet shooting from the quasar 3C273, providing an X-ray view into the area between 3C273's core and the beginning of the jet.High-powered jets driven from quasars, often at velocities very close to the speed of light, have long been perplexing for scientists. Instead of seeing a smooth stream of material driven from the core of the quasar, most optical, radio, and earlier X-ray observations have revealed inconsistent, "lumpy" clouds of gas. 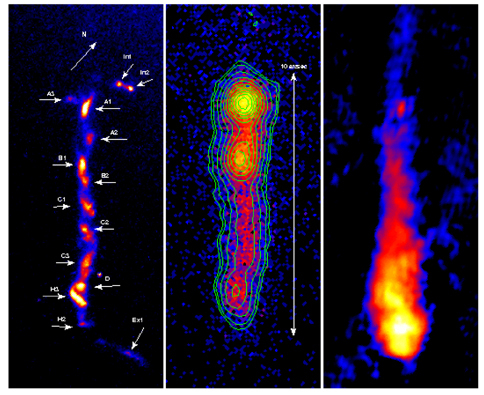 The recent Chandra data show a continuous X-ray flow in 3C273 from the core to the jet, which may reveal insight on the physical processes that power these jets. Scientists would like to learn why matter is violently ejected from the quasar's core, then appears to suddenly slow down. The energy emitted from the jet in 3C273 probably comes from gas that falls toward a supermassive black hole at the center of the quasar, but is redirected by strong electromagnetic fields into a collimated jet. While the black hole itself is not observed directly, scientists can discern properties of the black hole by studying the jet. The formation of the jet from the matter that falls into the black hole is a process that remains poorly understood. Scale Image is 24 arcsec across. Coordinates (J2000) RA 12h 29m 06.70s | Dec +02° 03´ 08.60"